These gifts were made available for you in the the spirit of sharing. It gives everyone an opportunity for personal involvement. Through the purchase of a gift or by making a donation, you are helping build a strong, happy and healthy community. Every gift you share is tax deductible. Please join together with your friends, family or co-workers to contribute to this worthy cause. 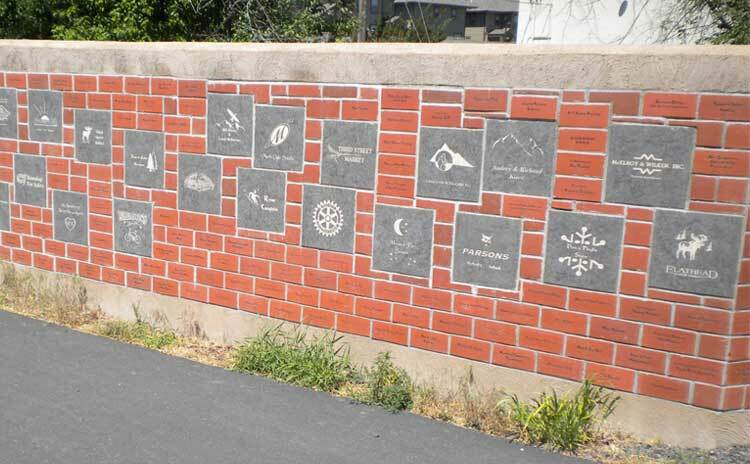 Just as the trail will be used by everyone, we welcome gifts from the community, businesses, organizations and individuals from all walks of life. We also honor requests for anonymous donations. If you have any questions, please contact us. We would love to hear from you. Please browse the catalog. After making a gift selection, mail us the attached form with a check or money order. Or, you can donate using debit or credit card on Paypal by clicking on the Donate button. If you donate on the Paypal site, please send your gift selection to us either by postal or e-mail. 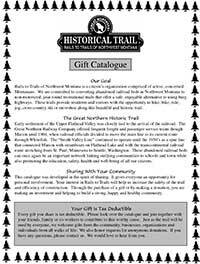 Rails to Trails of Northwest Montana is a non-profit organization with 501(c)(3) status. All contributions are tax deductible and sincerely appreciated! Clicking on the Donate hyperlink will take you to Paypal, an independent site not affiliated with Rails to Trails of Northwest Montana. Rails to Trails is not responsible for the content, accuracy, security,or propriety of the information or functionality contained on this external website.